We are a leading Manufacturer of high back director chair from New Delhi, India. 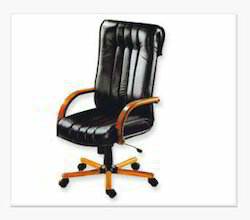 Our organization is instrumental in offering a wide range of High Back Director Chair. The aesthetically designed director chairs have distinct styling and classic looks. The 'wrap-around’-contoured backrest with high-density foams provide maximum comfort to the users. Note : Low Back chair available in matching design. Looking for Director Chair ?